It’s cold & snowing outside and my 49ers just lost and got booted out of play-off contention so comfort food is needed. Stat. Once both are done, mix in a baking dish, pour in a jar of sauce (or gravy if you prefer Corleones) and a few handfuls (big giant football player handfuls) of mozzarella. Make sure mixed well and bake at 350 (oh yeah…preheat your oven) for 25 minutes or so. 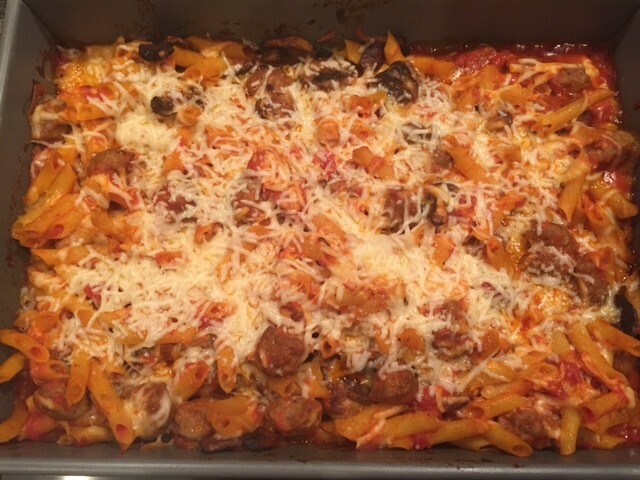 FYI – I used “Rao’s Homemade Arrabbiata” sauce to keep with the spicy theme. Then sprinkle Parmesan on it and bake a few more minutes. 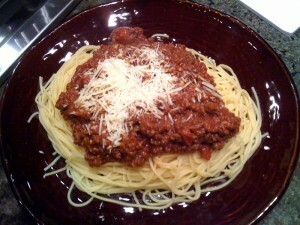 I love this pasta sauce – a lot! But I make it like once a year. First, because I try to limit the number of times I eat plates of pasta but also because it is so delicious due to the ridiculous fat content. Not a light, summer-time bikini-season meal for sure. But hey – it’s a cold and snowy February right now! I found this recipe online and have tweaked it a bit for my own tastes since. But the body of it is as found online and I take no ownership of it other than my own minor tweaks due to personal taste. When I went to the store yesterday to buy the ingredients I couldn’t find the pancetta. So the meat counter guy helped me and asked me what I was making. I said pasta. He looked at me quizzically. I said you know – spaghetti. 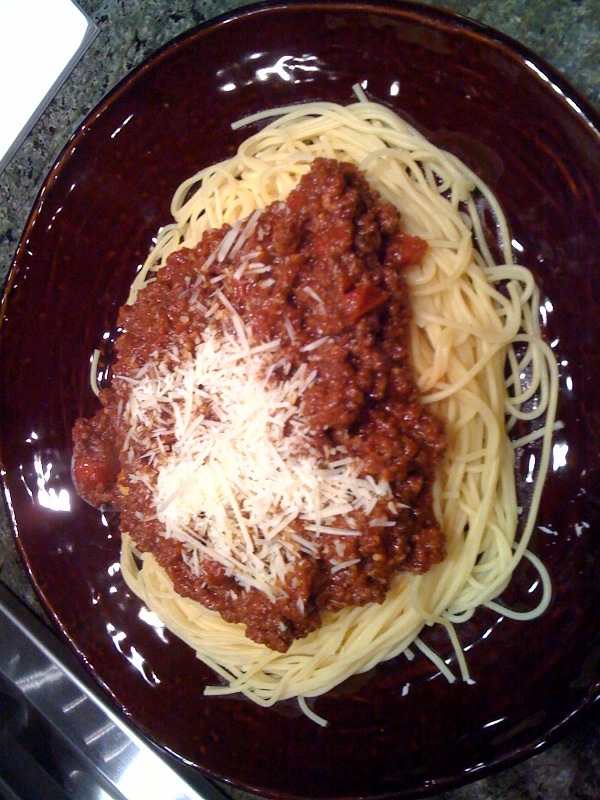 He said Ahhh…”fancy” spaghetti. OK, OK. Pasta/Spaghetti, tomato/tomahtoe. I wasn’t calling the whole thing off :) I guessed by looking at him that I probably could have said macaroni and gravy and he probably would have known and maybe even given me some tips! Combine butter and olive oil in a large heavy-bottomed pan over medium heat (keep in mind you will have 2 quarts of liquid going in so I use a 4qt pan.) Add the onion. Season with salt and pepper and cook, stirring frequently until the onion (all veggies if including them) soften and begin to brown – about 15 minutes. Add the garlic, then add the beef and pancetta. Cook, stirring occasionally, until the meat is thoroughly browned, about 25 minutes. Stir in tomato paste and cook for 5 minutes. Add the milk and simmer actively until the milk reduces and is absorbed, about 15 minutes or so. (I lower the temp to low and simmer longer than the original recipe for this part) Add the wine and simmer until the pan is once again almost dry (liquid reduced). This can take some time – 1 hour or even longer. Add the tomatoes and stock, adjust the heat so the sauce gently simmers and cooks for about 3-4 hours. All of the simmering times are going to vary a bit depending on your stove (gas or electric) and pan. So use your judgment and not just a timer. Simmering longer is always a better option with pasta sauce – always tastes better! 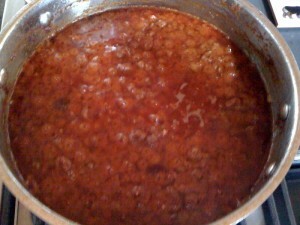 The recipe is officially a Bolognese sauce recipe. By keeping the carrots and celery out and using red wine I tweaked it from that a bit but I think can still fall in the category – especially for this non-Italian whiter than white girl! :) I will also try adding some porcini mushrooms next time! As I was cooking this today, I was thinking I wanted to see The Godfather, or even The Sopranos. Badda-bing badda-boom – I turn on the TV and on AMC they are playing a Godfather marathon: kismet :) One of my all-time favorite movies – amazing film full of great story and even greater acting.